BBC World Service - Health Check, Dr Who - Who Will Lead The WHO? Dr Who - Who Will Lead The WHO? Next week we will have a new figurehead for the global health community – as the World Health Organization votes to appoint a new Director General. The role is a tough one – with a flu pandemic long overdue and challenges such as Zika and Ebola. 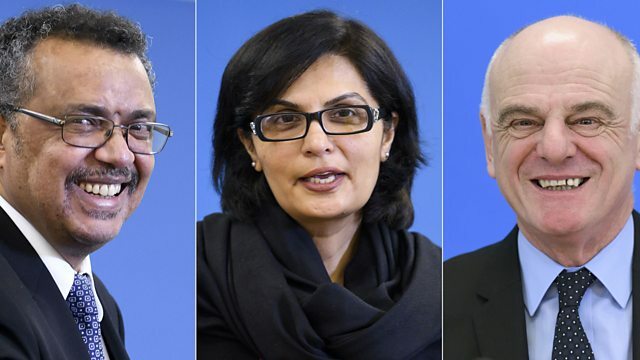 We hear from the final three candidates – Tedros Adhanom Ghebreyesus from Ethiopia, Dr Sania Nishtar from Pakistan and David Nabarro from the UK – about what they think they could bring to the role of guardian of the world’s health. Global health experts, Chelsea Clinton and Devi Sridhar the authors of a new book, Governing Global Health: who runs the world and why? guide us through the most important international players focusing on global health. Campaigns to eradicate the spread of AIDS, SARS, malaria, and Ebola highlight the need for a coordinated approach – including bodies like the World Bank, MSF and the World Health Organization. And as more private money is invested, what do we know about the accountability and effectiveness of such partnerships? According to Clinton and Sridhar, there has been little data available – until now. They look at the strengths and weaknesses of partnerships like the Global Fund (to Fight HIV/AIDS, TB and Malaria) and the GAVI Alliance which focuses on vaccinating against infectious diseases – and compares their work with two more longstanding major international organizations - the World Health Organization and the World Bank. The assumption that humans can’t detect differences in odours as well as creatures like dogs is overblown, according to one American researcher. John McGann - who spent much of last year surveying the historic scientific literature and research data around smell - believes there is a confirmation bias towards thinking humans have a poor sense of smell. Claudia talks to John about the reasons behind why we might have underestimated this fifth sense. How well do humans smell?